This English common press, made around 1720, may have been used by Benjamin Franklin in John Watts’ shop in London around 1726. 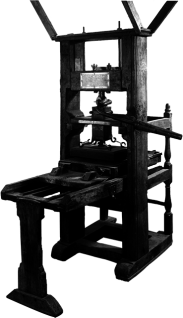 The common press, a wooden hand press that uses a large wood screw to create an impression on paper, is based closely on Gutenberg’s press, which was designed three hundred years earlier (see Gutenberg). In 1841, the Franklin press was acquired by John B. Murray, an American, who shipped it to the United States. The press was put up for public lottery, and was shown at the Patent Office, the Philadelphia Centennial Exposition, and the Smithsonian’s U.S. National Museum before being sold to the Smithsonian in 1901. The elderly Franklin shows evidence of wear and of numerous small changes and fixes made over the years. Overall, it is remarkably complete. It carries two brass labels: the larger, dated June 1833, describes Franklin’s re-visit to the Watts shop, when he ordered a gallon of porter for the printers and toasted his old press. The second, dated November 1841, records the presentation of the press to John Murray by Harrild & Sons of London. This Franklin is not to be confused with George Gordon’s press of the same name (see Gordon Franklin), a platen jobber made about 140 years later.